The new Befree Sound Dual 10 Inch Subwoofer Bluetooth Portable Party Speaker with Sound Reactive Party Lights, USB/ SD Input, Rechargeable Battery, Remote Control And 2 Wireless Microphones is an all in one entertainment assistant for the most advanced entertainers around! This easily portable speaker includes hard mounted top handles for your convenience, as well as embedded side handles, and boasts a large frame to ensure its highly visible. This unit is an ideal companion for your hardest workouts! With a hard hitting base line, and thunderous crystal clear sound, it will motivate you along with your favorite work out tracks to push past the ordinary. 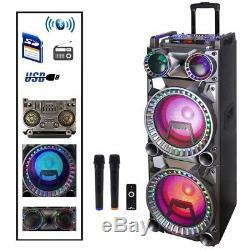 With such a Colorful Light Show Display built in, this sound system is sure to pump up the party! While your guests may already enjoy your music selections, this speaker will help you take your entertaining to higher level. You can connect a variety of devices, and choose the input that is best to suit your needs. You always have the option of turning down the reactive light show for those more subtle gatherings and allowing yourself to enjoy the strong, clear sound provided by the Dual 10inch Sub-woofers. This system acts incredibly well as a portable loud speakers, with Dual Wireless Microphones included, you'll really be able to make your voice heard! Should you find yourself giving a speech that may not require bright dancing lights, you can simply hit the LED power switch in the back and your speaker will boast a sleek classic look that's all business. EASILY CONNECTABLE: beFree has your convenience in mind! Bluetooth may be your favorite connection, and we understand, but there are times when other options are needed. BeFree Sound has jam-packed this ultimate party speaker with connections to ensure you have every option you need. Offering USB, SD and AUX Inputs. It also features Dual Microphone Jacks for your wired microphone, or your opt for using the included Dual Wireless Microphone and feel free to move around. DUAL LAYER REACTIVE PARTY LIGHTS: The Party never stops while this speakers light show is wowing your guests! There are two layers of individually reactive lights which change colors and move to the rhythm of your favorite tracks. While you may have had other party lights in the past, this speaker is sure to amaze and entertain with it's unique style and brilliant lights. EASILY PORTABLE: Hard mounted top handles, Embedded Side Handles, an an extendable Back Rolling Handle along with Dual Rolling Wheels make this unit easy to transport and handle. Designed with your convenience in mind so that you'll never have to leave this speaker behind! STRONG CLEAR BRILLIANT SOUND: This speaker won't impress you with it's size alone. The 10 inch Double Subwoofers offer a thunderous and thrilling power of this speaker will ensure that your guests will be moved by the music even if they lean against the walls! Adjustable Treble, Bass, Echo and Volume levels allow you to set the music just right. The item "NEW Befree Sound Dual 10 Inch Subwoofer Bluetooth Portable Party Speaker With So" is in sale since Tuesday, May 22, 2018. This item is in the category "Musical Instruments & Gear\Pro Audio Equipment\Speakers & Monitors". The seller is "ceshowroom" and is located in Los Angeles, California. This item can be shipped to United States, Canada, United Kingdom, Denmark, Romania, Slovakia, Bulgaria, Czech republic, Finland, Hungary, Latvia, Lithuania, Malta, Estonia, Australia, Greece, Portugal, Cyprus, Slovenia, Japan, China, Sweden, South Korea, Indonesia, Taiwan, South africa, Thailand, Belgium, France, Hong Kong, Ireland, Netherlands, Poland, Spain, Italy, Germany, Austria, Israel, Mexico, New Zealand, Philippines, Singapore, Switzerland, Norway, Saudi arabia, Ukraine, United arab emirates, Qatar, Kuwait, Bahrain, Croatia, Malaysia, Brazil, Chile, Colombia, Costa rica, Dominican republic, Panama, Trinidad and tobago, Guatemala, El salvador, Honduras, Jamaica.